The KB property is located in McCorkill township 35 kilometres east of the town of Chibougamau, Quebec. The property (locally known also as “Kill Bill”) is comprised of 30 claims covering 16.7 square kilometres located in the eastern limit of the Abitibi belt of Quebec. The property is easily accessible through an excellent network of logging roads. The KB project is considered to be highly prospective for zinc and copper due to the presence of an historic prospect and of drill intercepts associated with a massive sulphide stratigraphic horizon hosted within mafic and felsic volcanics. 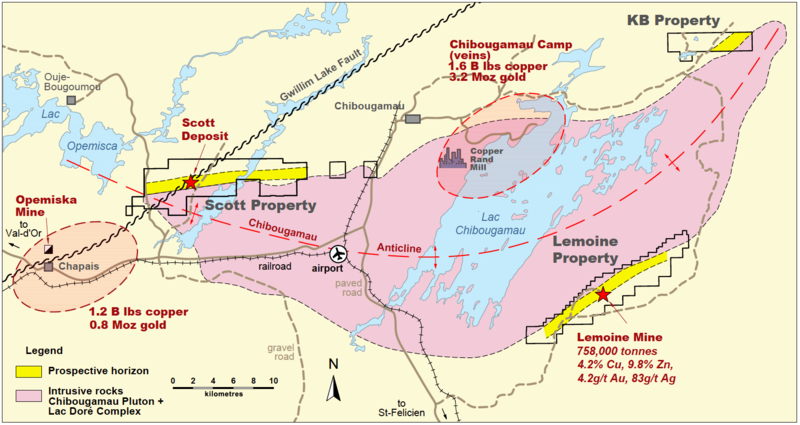 The property appears to have a geological setting similar to that found at Yorbeau’s Scott project, including high grade VMS-style mineralization, presence of felsic tuffs, and potential for high synvolcanic heat flow resulting from the proximity of the Lac Doré (synvolcanic) Complex. It is also in a stratigraphic setting similar to the former producing high grade Lemoine Mine which produced 0.76Mt of high grade massive sulphide ore (>$600/t at today’s prices). With grades of 4.2% Cu, 9.6% Zn, 4.2 g/t Au and 83 g/t Ag, Lemoine ranks number 2 in Canada (second only to Eskay Creek) and is within the top 1% of all VMS worldwide. According to Government files, historical drilling done at KB by Icon Sullivan in 1965 yielded up to 1.9% copper and 11.0% zinc over a core length of 1.0 metre of massive sulphides. 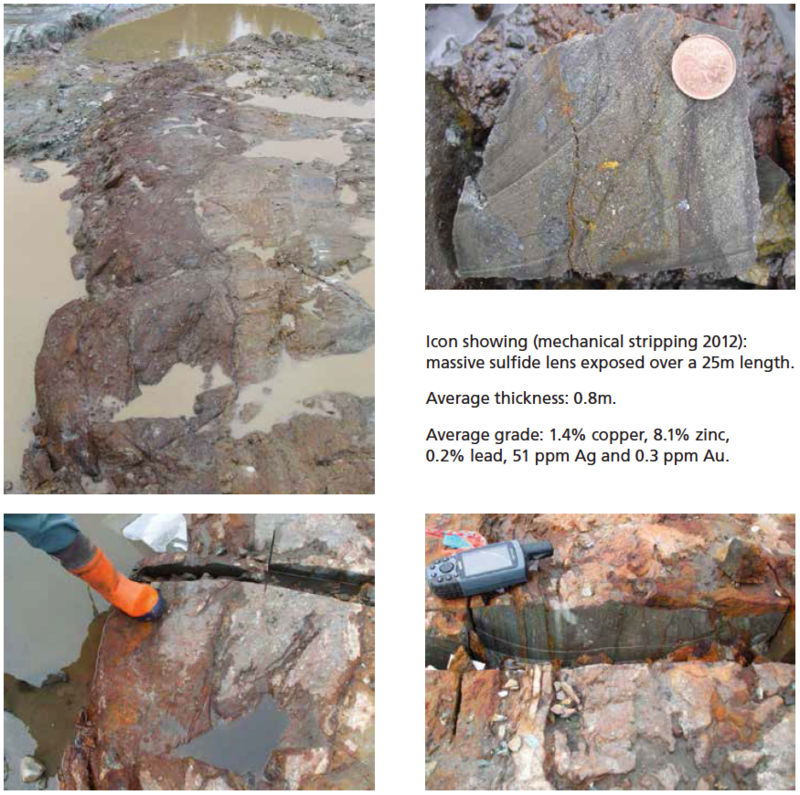 Recent trenching and channel sampling of the massive sulphide horizon done in 2012 by vendor Ressources Tectonic Inc yielded an average of 1.4% Cu, 8.1% Zn and 51.5 g/t Ag over a thickness of 0.8 metres. A series of grab samples taken from that trench by geological staff of Cogitore Resources in late 2012 yielded similar results with, in addition, an average gold grade of 2.2 g/t Au. Mineralization in the grab samples consists of banded massive sulphides containing pyrrhotite, pyrite, sphalerite and chalcopyrite. The KB project is subject to an option agreement to acquire a 100% interest from a private company. The option agreement includes total cumulative cash payments of $200,000 and exploration expenditures of $750,000 over a three year period. Except for an initial $30,000 cash payment already made upon signing and the first $150,000 in exploration expenditures, all payments and expenditures are optional. The vendor would retain a 1% NSR production royalty, which can be bought back entirely at any time for $1.5 million. With the current positive outlook for zinc and the recently announced positive Preliminary Economic Assessment at the Scott project, zinc prospects in the Chibougamau mining camp with features similar to the Scott mineralization, such as KB, become strategic for Yorbeau. In spite of local high grade zinc mineralization at surface, the KB project has never been drilled below 150 metres vertical, and has yet to be explored using modern volcanogenic massive sulphides concepts. The Company is looking forward to initiate exploration on the new project. An airborne electromagnetic VTEM survey was completed in early 2018 and the Yorbeau technical team is now ready to initiate field follow-up.